August 1 2014, 8:15AM EDT. Immediately after releasing his 31st pitch of the night, Cliff Lee shouted an expletive while grabbing at his left elbow. He walked off the field moments later, eventually burying his head in his hands in the visitor's dugout at Nationals Park. "My last few pitches, I felt at any moment something could snap," Lee said. "And that's the end of it. I obviously didn't want that to happen." Lee landed on the disabled list on May 20 with a flexor pronator strain and returned to the Phillies rotation just 11 days ago. He's now back on the 15-day disabled list and likely done for the remainder of the 2014 season. At this point, the severity of Lee's injury is unknown. 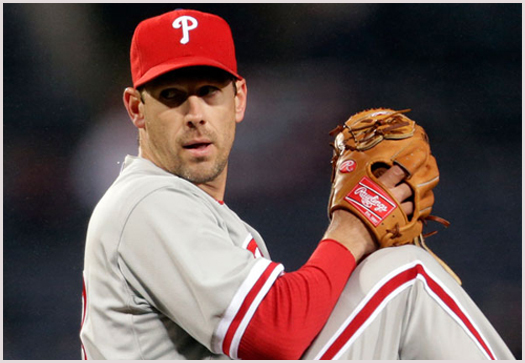 The initial diagnosis is a reoccurrence of the flexor pronator strain, but the soon-to-be 36-year old will meet with doctors Friday in Washington and undergo more tests when the Phillies return to Philadelphia next week. Tommy John surgery is a real possibility, meaning Lee may have thrown his last pitch in a Phillies uniform. "[Surgery] is obviously a possibility," Lee said. "I really don't know right now. I'll have doctors look at it and do more tests." Lee said he began to feel minor pain in the elbow in late April, but it was tolerable. He made three rehab starts and said the discomfort was still there, but dissipating. "It progressively got better," Lee said. "My first rehab start, it was barely there. The next one, it was better. The past two starts it wasn't really there at all. I was thinking it was gone. I don't know what happened from yesterday to today. My first couple of throws playing catch to start the game, it was barely there. I don't really understand why that happened." Since returning to the rotation Lee allowed 21 hits and surrendered 9 earned runs over 10 2/3 innings. "My past two starts, I just kind of felt tired the whole time," Lee said. "My body wasn't fully ready to compete at the highest level. Today, body-wise, I felt great. I felt normal. My elbow was not allowing it to happen." The timing of Lee's injury couldn't be worse for the Phillies. Though the non-waiver Trade Deadline passed on Thursday, Lee was rumored to still possibly be moved via waivers at some point in August. That likely won't happen now and the Phillies remain on the hook for the $25 million Lee is owed next season. "This is bad, all around," Lee said. "I have no idea what's going to happen next."